【96-CHANNEL】Dual transmitters triggered by one receiver which can be used for multiple devices working together, with auto-scanning for quick channel selection to A/B group.Group A Wireless Frequency:520.000MHz~548.500MHz. Group B Wireless Frequency:550.000MHz~578.500MHz. 【REAL-TIME MONITORING】With lattice LCD display, HD display dynamic volume test bar and transmitter power, real-time monitoring of volume and power.The receiver can see the transmitter's volume bar display.Different frequency channels each with adjustable independent 16 Levels volume controls. 【MIC/ LINE IN MODE SWITCH】You could use the two transmitters in different ways, such as one transmitter is responsible for sound pickup, another transmitter is responsible for the background music, so that the receiver can get background music recordings. 【LONG WORKING DISTANCE】Working distance up to 394 feet(120 meters) (in open area, up to 263 feet(80 meters) in Barrier Area). By adopting UHF technology, it can realize smooth recording without staccato. 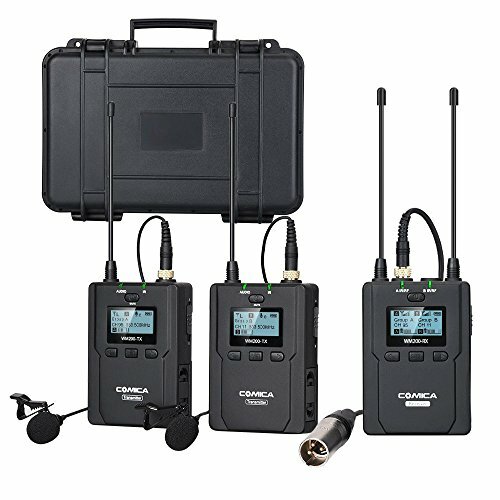 【ADJUSTABLE RF SIGNAL STRENGTH】The CVM-WM200 wireless microphone is made of full-metal manufacturing, with excellent shielding. When the working distance is within 197 feet, you can switch to low strength mode, which helps to reduce power consumption for longer standby time. When the working distance is longer than 197 feet, you can choose the high strength mode to improve the audio quality. (1 Year Warranty). If you have any questions about this product by Comica, contact us by completing and submitting the form below. If you are looking for a specif part number, please include it with your message.